Heroes are not made in the warm hallways of cul-de-sac safety. Nor are they made of black and white print from the critic's air-conditioned desk. Kindness, gentleness, love, peace, joy. Would you be more likely to describe these character traits as "masculine" or "feminine"? My name is Rev. Gary Wiley, pastor of justice and care at Trinity Grace Church in New York City. I am an evangelical Christian. 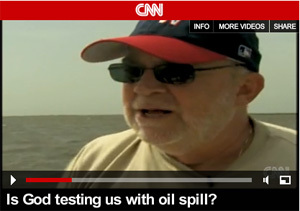 Editor's note: "Voices From the Gulf" is a series of posts from people experiencing first-hand the devastating effects of the worst oil spill in American history. Check back often for more stories each week. The captain was the first to smell it. He told us that the ocean didn't used to smell this way. Then, we all smelled it. We are witnessing a massive despoiling of God's creation that will impact ecosystems for generations. Our response must think that far ahead as well -- to our children and our children's children. About 25 years ago, the pastor of a relatively poor congregation had an accident and racked up a huge medical bill in the hospital. Somebody sent that sign to my wife Joy and she promptly put it up outside right next to our front door. It's true -- our family now organizes life around baseball. Sometimes in life you learn best not from the times that you shine, but from the times that you act like a total ignoramus. It seems that racism and fear of outsiders are on the rise in the U.S.A. It wasn't that long ago that the state of Arizona did not recognize, in fact went out of its way to criticize, the celebration of Martin Luther King Jr. Day. Certain moments in our nation's history have consistently opened the door for the least civil voices to enact evil through civil policy: think the institution of race-based U.S. slavery, the Indian removals, Jim Crow laws, legalized segregation, the federal protection of lynching mobs, and, don't forget, the Japanese internment camps, among others. From the borderlands perspective, it has been a week of momentous steps both forward and back for immigrants.